I put together a small server today, to serve as DVR server for a CCTV system. This server connects to an office LAN and a separate LAN for the IP cameras, so I needed two network interfaces. 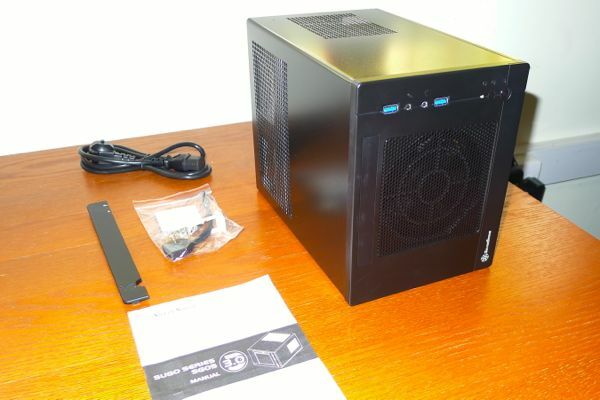 It lives in a small, minimally ventilated room, so I wanted a small form factor, but with sufficient airflow and enough space to work with comfortably. The room is used as an office, so I wanted minimal noise. The software is used remotely; there is no permanently connected screen/keyboard, so I wanted remote management. I wanted virtualisation support (VT-x and VT-d), but have no need for too much CPU power. This machine is not mission-critical, so there is no need for RAID. For remote management, the CPU needs graphics and Intel vPro Technology support. The i5-3470S was the cheapest CPU with those features that my supplier stocked. 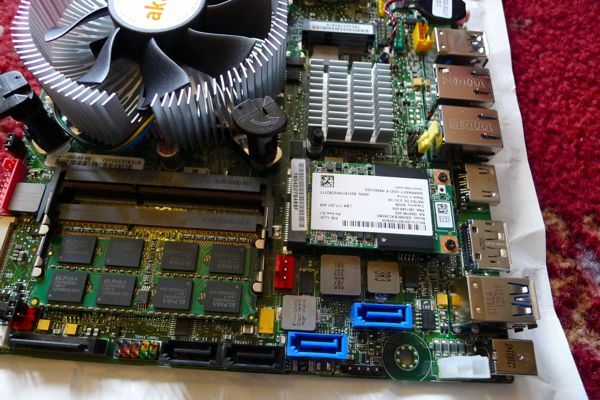 The DQ77KB is a Thin-ITX board that needs a 19V PSU. I picked an external supply to keep the heat out of the case, keep the noise low, and allow for easy future replacement. 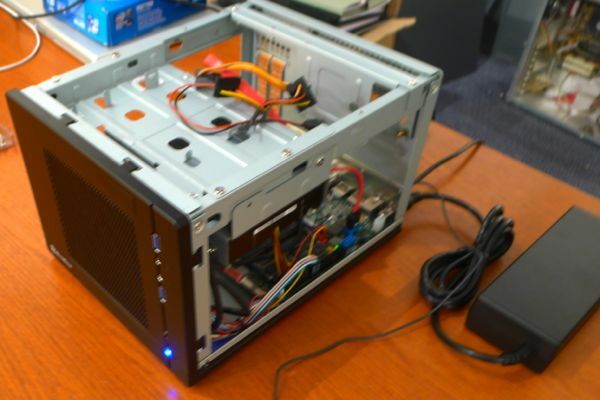 I selected the SG05B for its good ventilation (large slow chassis fan), sturdiness (steel body) and internal space. The SG05B comes with a PSU that I do not need. The recently announced a SG05-Lite comes without a PSU, but that is not yet widely available in the UK. I simply removed the PSU, and covered the case hole with some hexagonal mesh scavenged from a junk ATX PSU and cut to size. The DQ77KB has mSATA support, which I like for keeping the build clean a simple. The mSATA board fits into a slot at one end, and is supported by screwposts on the other. The screws were very tight, and unscrewing actually unscrewed the posts; I had to hold them with pliers. The low-profile heatsink was not strictly required, but I like how quiet this model is, and how its design encloses the fan which helps keep it away from cables. I'm not delighted by the Thin-ITX power specification: having to source a specific 19V supply is a hassle, and the power socket has no lock and could easily be accidentally knocked out. For this particular build, the low-profile of Thin-ITX didn't matter; I would have been quite happy with a standard Mini-ITX board. 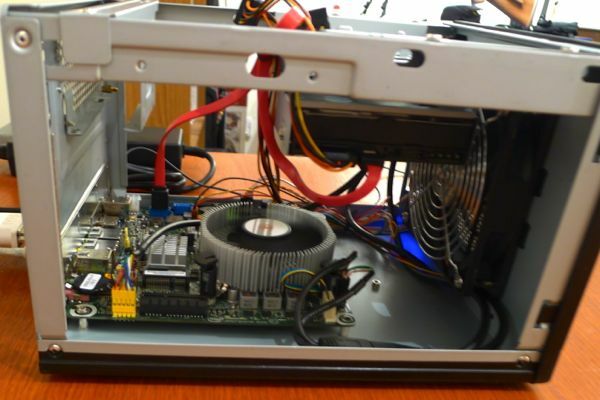 The total bill of materials is higher than a typical Mini-ITX build; if you can drop some of the requirements, you can save money by choosing a smaller case, a more mainstream board frmo a more cost-conscious manufacturer, and a cheaper CPU. 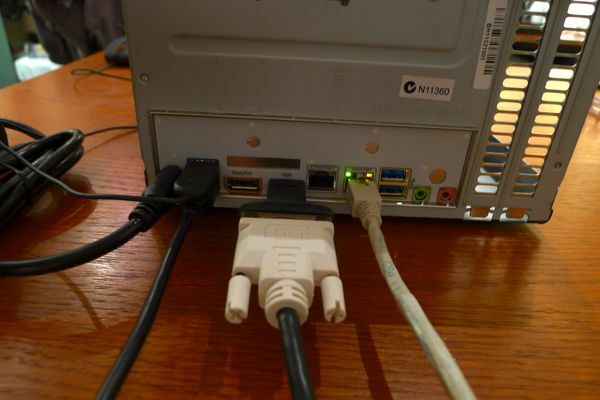 How-To Geek "How to Remotely Control Your PC (Even When it Crashes)"
Michael Kuron: "Using Intel AMT’s VNC server"
I used a separate IP address for AMT, with the same ethernet interface also using a second address for normal LAN access. 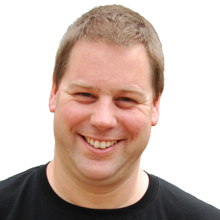 See the ArchLinux page about KMS for details. I upgraded the BIOS to the latest KBQ7710H.86A.0051 (from KBQ7710H.86A.0038), using the F7 method and a USB stick. Ubuntu 12.04 LTS installed without any problems. It takes 25 seconds from Power-on to login, and from reboot to login, including 2 seconds of grub delay. kvm-ok reports "KVM acceleration can be used", VirtualBox runs fine. It's small, quiet, powerful; good stuff.